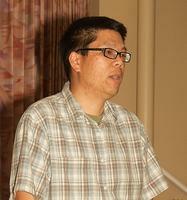 Peter T. LinWe are pleased to welcome back Peter Lin as our speaker for February. Peter will present the topic ‘Neofinetia falcata and its Hybrids’, which will feature this Japanese native orchid species, a bit of history, the many forms and varieties, and a selection of its hybrids within the Vanda alliance. He also will describe how to grow these marvelous temperature tolerant orchids. Neofinetia falcata is native to Japan and has been grown there for centuries. They are highly treasured and come in many flower forms and leaf forms. It has been used with other vandaceous genera to produce charming compact hybrids. Peter started growing orchids over 25 years ago, but then stopped due to school and starting a career. It wasn't until about 9 years ago that the orchid "bug" came back and he is now heavily involved once again. He is an accredited judge with the American Orchid Society and a hybridizer of mini-catts. He enjoys meeting with other orchid enthusiasts, and can often be found at various orchid shows and societies around the country. He also has thousands of photos of his orchids that he maintains on Flickr. Due to limited growing space, Peter likes to specialize in miniature orchids, both species and hybrids, and has received numerous AOS awards. His other interests in orchids include Dendrobiums, Angraecoids, and of course Neofinetias! He maintains a collection of a thousand or more orchids at his home in Southern California in 3 small greenhouses, outdoors, as well as in the house under fluorescent lights. His website address is www.diamondorchids.com. Peter will be providing the plants for this month's opportunity table. There will be a nice selection of orchids, so be sure to buy lots of tickets!